Unfortunately, I do not have a video for you today but I do have a card to share. I have been working tirelessly on my craft room so I have not had time to record for you. I'm hoping to have a video for you later this week depending on my craft room progress. I felt like putting a warning above the picture but the more I look at the card, I like it more and more. You can join directly through my website by clicking Join the Fun. 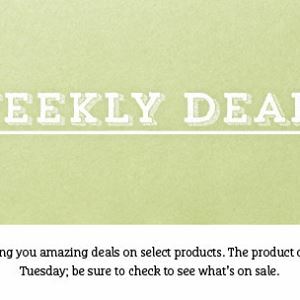 Every Tuesday, I will share the NEW weekly deals with you. So, here you go! Don't forget about the clearance rack too! Today's project is a thank you card using pool party, island indigo and some vellum. If you are considering joining the Stampin' Up! family, now is the best time. You will receive $155 worth of product for $99. This is an AMAZING deal! Join as a hobbyist or start your own business. Today, I have a cute little treat bag for you that only takes a few minutes to make. These are super simple and quick to make for any occasion or even mass produce for a shower etc. Enjoy! Today's project is another simple card with soothing colors. I used crumb cake, whisper white and perfectly artistic designer series paper in crumb cake. I would love to know what think so please leave me a comment. Visit my website to see the Sale-A-Bration items you can earn FREE with every $50 purchase. Don't forget to follow my blog. Hello! Today's inspiration was a full size card I made probably a year ago which I turned into a notecard size. It has been such a gloomy week here, I needed some bright and cheerful colors. I used watermelon wonder and cucumber crush! Super fun! You can order a set of 10 notecards and envelopes from the annual catalog. That is an awesome value. So versatile and a great size. Paper Pumpkin is turning 3! See how you can join the FUN! Quick post today. If you are not already a Paper Pumpkin subscriber maybe this short video will get you MOVING :) Why? Because you are missing out on the FUN! Paper Pumpkin is turning 3 and Stampin' Up! is adding an extra little something to the April kit. Subscribe by April 10th by clicking HERE. See you tomorrow with another video. I have a super simple card for you today. Who doesn't love simple, right? This card would make a great set! Sale-A-Bration ends March 31, 2016. Earn your free products today! Here are this week's deals. This is a great way to stock up at discounted prices. Also, don't forget about the clearance rack. See you tomorrow with another video! I have a fun project for you today showcasing the Botanicals for You stamp set. This stamp set is available during Sale-A-Bration until March 31, 2016. I used basic black, real red, gold embossing powder and vellum on this card. Sale-A-Bration ends March 31, 2016. Earn you free products today. Today, I wanted to share the recent Paper Pumpkin kit from Stampin' Up!. This was the February kit which consisted of 9 cards and envelopes. For those that do not know about Paper Pumpkin..it's basically a monthly subscription. Every month you receive a surprise kit in your mailbox which includes all the materials needed to make the project. Paper Pumpkin can be ordered month to month, 3-months at a time or even a full year! Plus, during Sale-A-Bration if you order a 3-month Paper Pumpkin subscription, you will also get to choose a FREE item from the Sale-A-Bration flyer. So, check out this video to see what a kit looks like and what's included. To subscribe to Paper Pumpkin click here. If you order by the 10th of the month you will get that month's kit. Example: If you order by March 10th, you will receive March's kit. Hello! Here's another super quick birthday card. This card was made using one of our Sale-A-Bration stamp sets called Party Pants. This stamp set is available through March 31st so get it while you can for FREE with a $50 order. Here's a video to show you how I created this. Here are the current clearance rack items too! Happy Monday! Today, I have a cutsie card for you that I made for my new downline team member. I wanted to thank her for joining my team and what better way than with a handmade card. I used the hostess set called "Love You Sew" from the current occasions catalog. It's super fun because it's a crafty set that every crafter should have. I'm super excited for today and the weekend. Why? Because my BFF is coming tonight so we can craft! Best day ever!! 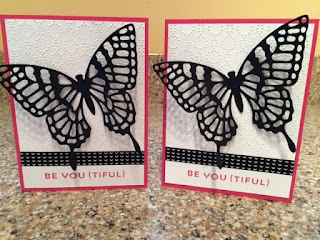 Today, I have a cute card to share with you using the Lovely Amazing You stamp set (140594). This is a stamp you will not find in our catalog but is SUPER cute. I love love love the font and sentiments in this set. I look forward to sharing some more projects with you next week! Can you believe it? I'm back with another video!! 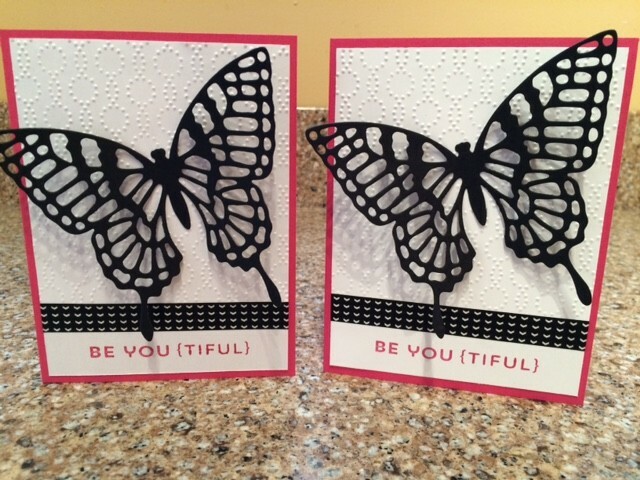 Here is another card I made using the Remarkable You stamp set. I'm calling it Part 2. Here are this week's deals! Love the tin of cards, red foil sheets and tag topper!! To order any of these items, click on the picture or click here. Don't forget about the clearance rack...lots of good items at GREAT prices.